In 1985 I travelled all over the world running, talking (and drinking) and this was probably the fittest year of my life. In this year I took part and completed 5502 miles of competition. This mileage adding to my training runs did not make me the fittest man in the world but it certainly made me the fittest Malcolm Campbell. An ultramarathon is by definition any footrace longer than the standard marathon distance. It can be as short as 50kms or as long as your imagination. The International Association of Ultrarunners (IAU) was formed in 1984 and this 25th Anniversary Year of its formation seems a good time for reflection. I was one of the founding members of the IAU and the first President and held that position until my retirement in 2004. In April, 1980 I returned from France after competing in a 24 Hour Track Race at Coetquidan with the news that Jean-Gilles Boussiquet had broken the World Best Performance (WBP) for 24 hours on the track with a distance of over 260km. At that time the only organisation examining record claims for ultradistance events was the Road Runners Club (RRC) based in the United Kingdom. The RRC were not happy with the way that Boussiquet’s lap sheets were recorded and would not ratify the record. When I advised the organisers they responded that their “raison d’etre” was not to make the RRC happy. It was an embarrassing situation for me. I had many friends in France and I knew the event at Coetquidan had been properly organised and Boussiquet’s distance fairly achieved. In fairness to the RRC there were many claims for record performances claimed around the world which could not be substantiated. I had finished in fourth position at Coetquidan and Gerard Stenger who would later become one of the IAU founders finished in second position. We spoke of the problem and thanks to Gerard’s efforts Boussiquet was persuaded to run in the United Kingdom. At the Blackburn track in October 1980 – just six months after his great run at Coetquiddon – Boussiquet achieved over 264kms which the RRC were obliged to ratify as a WBP. The following year in Laussane he would increase the record further to over 272kms. In late 1981 Geoff Richardson supported by myself and some good friends introduced Six Day Track racing back into the United Kingdom after a lapse of nearly 100 years. Our event at Nottingham was won by Mike Newton who was one of the leading British ultrarunners with a distance of over 500 miles. The event would take place annually at the Harvey Hadden Stadium, Nottingham for the next five years. Most marathoners will know the Pheiddipides ran from Marathon to Athens with the news of the battle declaring “Rejoice, we conquer” and promptly dropped down dead. Not so many will be aware that before the battle our hero had run from Athens to Sparta – a distance of about 246kms – asking for help in the forthcoming battle. 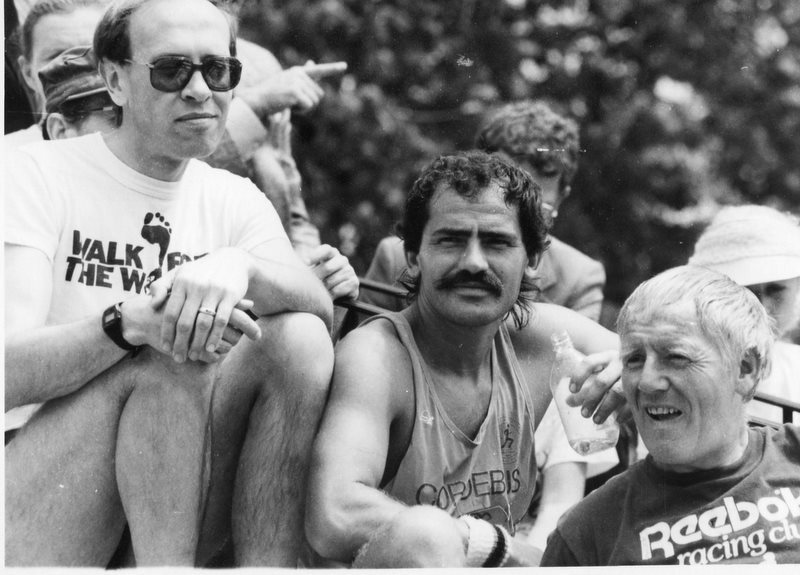 In 1983 I was asked by the Race Director, Mike Callaghan, to nominate suitable runners to be invited to take part in the inaugural “Spartathlon” a 246km race from Athens to Sparta with a time limit of 36 hours. I duly made my recommendations and only one was queried. The organisers burnt much midnight oil on the subject of women taking part in what many saw as a military feat only suitable for men. Common sense prevailed and Eleanor Adams took part and finished well. The Spartathlon winner was Yiannis Kouros, a young Greek marathoner, who finished an incredible distance ahead of the field. His winning time over a rugged and testing course was 21hrs 53 minutes. His pace projected to 24 hours would have given him a distance better than the world 24 hour record. Some doubts were expressed about the performance of Kouros. He was a novice in the ultradistance world and had beaten so many established performers that it was hard to persuade a cynical world that a new star had arrived. My friend Bruce Slade who had taken part was convinced that Kouros had won the race without any assistance and we set our minds to the problem of seeing that Kouros was given the respect he deserved. Edgar Pattermann, a talented veteran Austrian ultrarunner and a friend had successfully completed the inaugural Spartathlon. Edgar agreed to stage an event in Austria and invite Kouros to take part. The Danube Run was a three day stage race and against some outstanding competition. Yiannis Kouros won all three stages. Many reports later remarked that his victory in the Spartathlon had been vindicated. Kouros became the greatest ultradistance runner of all time. The Danube Run made 1984 a suitable time to announce the formation of the IAU. The founding members on the Council were Edgar Pattermann (AUT), Gerard Stenge(FRA). Andy Milroy (GBR), Dan Brannen(USA), Tony Rafferty(AUS) and Malcolm Campbell(GBR). All were experienced ultrarunners with the exception of Andy Milroy who was one of the worlds leading ultrarunning statisticians. I was selected to be the President of this unique organisation. We soon had representatives in many countries where the sport was popular. Because I competed often, although it has to be said at a modest level, I was the public face of the IAU. I carried the message and was the ancient marathoner “who stoppeth one in three” with the news of ultrarunning. The 1985 mileage was boosted by a challenge race across America when I was matched against Marvin Skagerberg(USA). This was a stage race with an average daily distance of 40miles and an overall distance of 3559 miles. I had never beaten Marvin in competition and with only a few days to go in the race Marvin took a wrong turn on the way to Pittsburg and after getting back on course he was over 2 hours behind me on the overall times. With only 12 stages to go I ordered the champagne and rang Bruce Slade in England saying that victory was “wheat in the bin”. There’s a lesson here somewhere and whilst it may not be true in life it’s certainly true in my life – just when you think you’re on your feet someone pulls the rug from under you. Marvin rallied on the following day and reduced my lead by 13 minutes. On the next day he reduced my lead by a further 12 minutes. I had the feeling he was heading for injury and I ran steadily but comfortably knowing I would finish. Gradually Marvin forced the pace and when we eventually arrived in New York on July 10th he had beaten me by 16 minutes. I had other races to take part in and following the Nottingham 6 Day Track Race, my friend, Dan Coffey, reminded me in October that I had promised to race him this year on the track over 1000 miles. Dan had challenged me during the Nottingham Six Day Race in which he had finished two places and 74 miles ahead of me. During the post race celebrations I had more than my fair share of champagne and must have nodded my head to Dan instead of shaking it. Joe Teesdale was a long distance runner with a great love of the sporting traditions in the North East of England I remembered Joe’s words and decided to ask him if he could organise a 1000 Mile Track race in his area. Even now I am not quite sure how he did it but three weeks later on November 11th a sign outside the Gateshead International Stadium read, “Will athletes please leave the two inside lanes free. A 1000 mile race in progress”. The Metropolitan Borough Council was very supportive. The Nottingham Building Society, sponsors of our Six Day races, provided a trophy. We called the race the David Niven 1000 Mile Track Race. James Niven had helped with sponsorship for our Trans American Race and we hoped that this event might increase public awareness of Motor-Neuron disease which had caused the death of his father. I telephoned Marvin Skagerberg in New York a week before the race. I told him it would be cold, hard and hateful and I was delighted when he said he would run. I knew that if I phrased it properly he would be unable to resist. We had a field, we had a trophy, we had a name for the race and we hoped that with Joe’s help we would have officials but we needed to know what 1000 Mile Track performances existed. Andy Milroy, IAU Statistician, gave us our first introduction to William Gale. Towards the end of the 19th century pedestrianism attracted the interest of the gambling public and huge sums were wagered on the outcome of two-man challenges or one man against the clock. On November 21st 1880 at the Lillie Bridge track, London, William Gale set off to win a wager by completing 2500 miles in 2000 consecutive half-hours. The terms of the wager meant that he would only be allowed to cover one and a quarter miles every half-hour and that he must continue to do this until the full distance was reached. Gale was a walker but, if no “fair heel and toe” clause was stipulated, he would almost certainly run when it became necessary to beat the clock. He would cover one distance at the end of a period and the next distance at the beginning of a period which would allow him about thirty minutes rest every hour. Gale was 48 years old and had been taking part in these challenges for over twenty five years. In this event Gale completed the first 1000 miles in the approved manner in a time of 16days 16hours and he went on to complete 2232 miles before abandoning the project and losing the wager. His 1000 mile time seemed to be the best on record and to beat it we would have to average about 60miles a day. However we would not have the severe handicap placed upon us that existed in that old wager. We could run, walk and sleep when we liked. My interest in Gale had now reached obsessional level. As money had been involved it is reasonable to assume that Gale was watched very carefully throughout the event and almost certainly he would have been cheered by his backers and jeered by those backing against him. Carrying responsibility for someone else’s money can be a heavy load to bear, and one can only imagine his feelings at coming so close to his target and then failing. He was however a professional, and may well have “taken the odds” at intermediate distances. Mentally I put William Gale in the race with us and when I refer to him during my race report do not consider that I am hallucinating – although come to think of it I did see him once or twice. It’s nearly 12 o’clock and we are at the starting line. Dan (112lbs) is the favourite and quietly confident. Marvin (147lbs) looks a little tired – he had arrived in England the day before and had a slight leg problem when walking but which seemed fine when he ran. Marvin said he was alright and following his win in the Trans America Race I knew he had a very strong competitive streak. I arrived at the starting line 14lbs overweight at 172lbs but that extra weight would prove useful whatever the doctors might say. Joe Teesdale recruited some outstanding officials for recording purposes and each completed lap of this 400metre track needed to be timed in an approved manner. There was a tragic beginning to the race as the starter, Mr. John Schofield, died on the first night of the race. He was a much loved man throughout the area and everyone spoke of him with great affection. John Dowling, the Sheffield long distance walker made himself responsible for seeing that we were well fed and watered as often as was necessary. There was a restaurant in the stadium which Marvin and I used for lunch and dinner. We also had a kitchen at our disposal but Dan simply stayed on the track and his rest breaks were few and short – he was running the race as a six day event and predictably he was establishing a huge lead. Marvin was in trouble and had set himself a tough schedule for 15 days after which time he needed to travel back to his work in New York Marvin retired from the race after six days with 301 miles. At this time Dan was 55 miles ahead of me with 419 miles. Although I had no schedule I had some rough plans. My main object was to beat William Gale and as long as I averaged 60miles a day I would do so. During the next few days Dan ran well but he was in trouble. He had not slept properly, whilst I had slept six and a half hours every night. I clocked on regularly each morning at 7.30 a.m. and only left the track for lunch and dinner. Dan had stomach troubles and to add to his miseries his hands started to swell dramatically. His walking breaks became longer and his running periods shorter. It was obvious that during this period he was weakening whilst I was becoming stronger and the distance between us gradually diminished. After nine days Dan reached 586 miles and I was 22 miles behind. He was still very weak but the 600 mile mark and the 1000km mark gave him new life. During the eleventh day I passed Dan. His difficulties had worsened and the Medical Officer pulled him out of the race. That was the only way Dan would come out of the race and after 11 days he had run 667 miles and I was on 698. I completed 61 miles on day twelve and was pleased to learn that I had ran 32 more miles in the last six days than the first six. John Dowling’s task was now easier and I realised the advantage of having an experienced handler. It had become a team effort with Maurice Robertson, the senior recorder, keeping me informed of my position in relation to Gale and Joe Teesdale counselling me when doubts crept in. After fifteen days I had reached 950 miles and shortly before midnight I had ten miles to go. I retired for sleep as usual and finished the race at about 9a.m. the following morning. I ran an extra five miles to be sure. My final time was 15days 20hours 55mins 11secs. The race had attracted considerable media attention with crews from BBC Television and ITV Television and whilst the attention was nice perhaps William Gale has the last laugh. After all he still has the 2000 Mile Track record. The year had finished and word about the IAU started to spread. We established the 100km event as a standard distance for international competition on the roads and by 1988 had obtained the Patronage of the IAAF which is the governing body for international athletics. We had our first IAU 100km Championships at Torhout, Belgium in 1987 and these have been held annually at various venues around the world from that time. It seems appropriate that on June 19th 2009 the IAU 100km World Cup will be staged at Torhout in this IAU Jubilee Year. I enjoyed being IAU President for 20 years but at 70 years of age I felt that 2004 was a good time to go. In 2004 there were about 35 National Federations as IAU Members and that figure will soon reach 50. During my 20 years in office some outstanding athletes emerged and they needed a platform to display their talents. They needed courses that were properly measured and races that were organised fairly. In IAU events they had these things and the sport prospered. It continues to prosper and those wishing to break out of the confines of rigid thinking should explore the world Beyond the Marathon. Malcolm Campbell – 27 January 2009.